This book re-examines the old debate about the relationship between rationality and literacy. Does writing "restructure consciousness?" Do preliterate societies have a different "mind-set" from literate societies? Is reason "built in" to the way we think? How is literacy related to numeracy? Is the "logical form" that Western philosophers recognize anything more than an extrapolation from the structure of the written sentence? Is logic, as developed formally in Western education, intrinsically beyond the reach of the preliterate mind? What light, if any, do the findings of contemporary neuroscience throw on such issues? 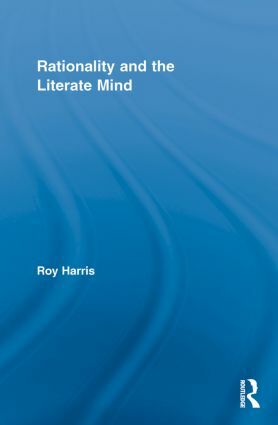 Roy Harris challenges the received mainstream opinion that reason is an intrinsic property of the human mind, and argues that the whole Western conception of rational thought, from Classical Greece down to modern symbolic logic, is a by-product of the way literacy developed in European cultures.